Holy Week Ceremonies represent in Sicily a complexity of contents and symbols which have been passed on from the different ancient populations which have settled in our beautiful land. Easter in Sicily has always created a deep feeling with devoted people but has also attracted many tourists from all over the world, due to it’s peculiar costumes and traditions. The evidence of this mix of traditions is visible during many of the ceremonies and studies have show how these are actually dated back to Byzantine’s cultures. During the Holy Week intact different tows revoke the Passion, Death and Resurrection of Jesus following local costumes and traditions. 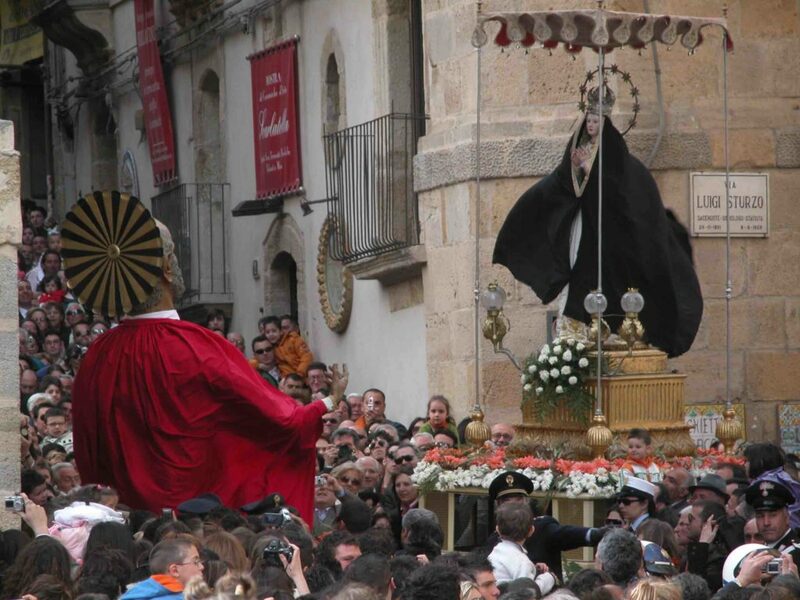 The Processions occur in the city centers and are formed by devotes and local people which dress like the traditions wants together with religious statues. The different Ceremonies are characterized by the large variety that the different towns follow. During spring Season at Taormina especially in the city center ( Corso Umberto ) the Holy Easter attracts the attention not only of local people but also of tourists, curious for the great pathos with which devotes manifest this holy tradition. Very characteristic is the representation of Jesus Passion also known as ” Procession of Mystery of the Holy Friday ” which occurs when the sun goes down and all the city center fall into darkness and silence creating a unique atmosphere lighted only by the traditional candle lights. People of the procession and the Religious Statues coming from all Taormina’s churches, walk all together through the city center dressed like the tradition, very peculiar are all the women dressed in black as sign of sorrow and young children dressed in white.